Think, Learn, Grow and Rejuvenate! Join us as for these Special Events! 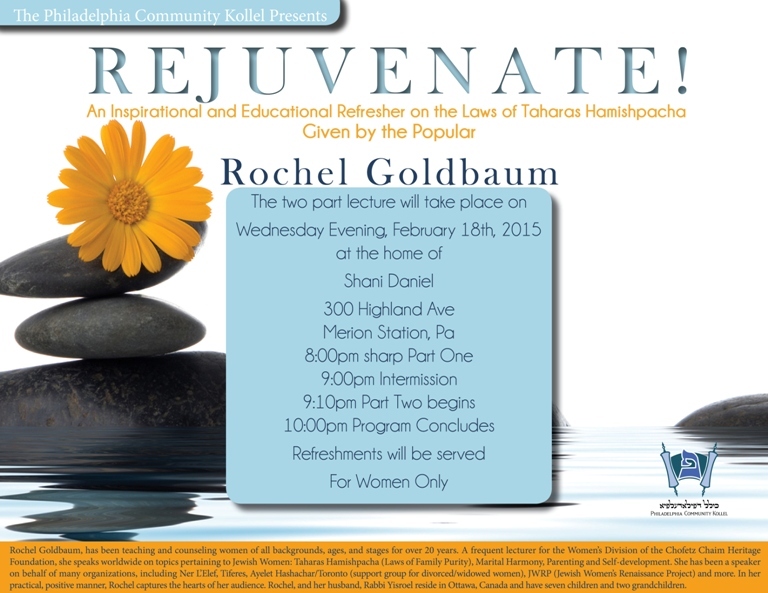 Rochel Goldbaum, has been teaching and counseling women of all backgrounds, ages, and stages for over 20 years. A frequent lecturer for the Women's Division of the Chofetz Chaim Heritage Foundation, she speaks worldwide on topics pertaining to Jewish Women: Taharas Hamishpacha (Laws of Family Purity), Marital Harmony, Parenting and Self-development. She has been a speaker on behalf of many organizations, including Ner L'Elef, Tiferes, Ayelet Hashachar/Toronto (support group for divorced/widowed women), JWRP (Jewish Women's Renaissance Project) and more. In her practical, positive manner, Rochel captures the hearts of her audience. Rochel, and her husband, Rabbi Yisroel reside in Ottawa, Canada and have seven children and two grandchildren. 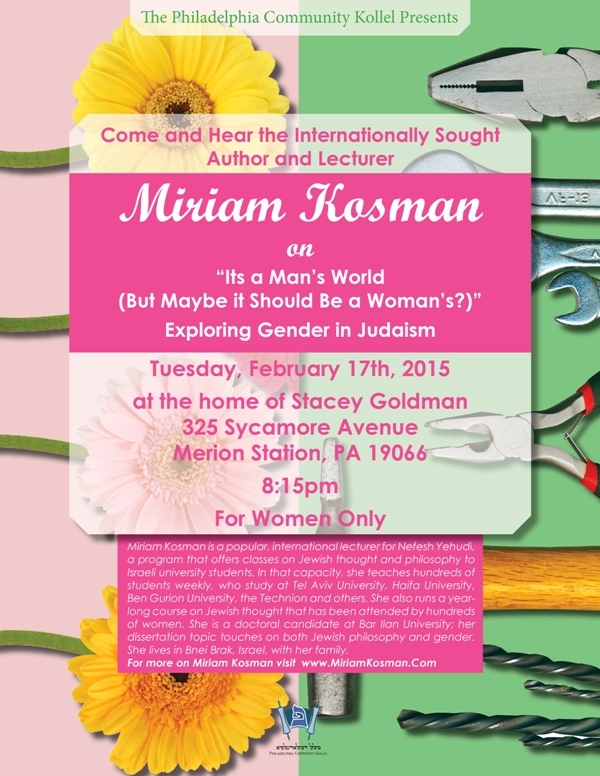 Miriam Kosman is a popular, international lecturer for Nefesh Yehudi, a program that offers classes on Jewish thought and philosophy to Israeli university students. In that capacity, she teaches hundreds of students weekly, who study at Tel Aviv University, Haifa University, ar Ilan University; her dissertation topic touches on both Jewish philosophy and gender. She lives in Bnei Brak, Israel, with her family.